Concerning the Rochdale Online article listed below, the Country Land and Business Association (CLA) state that they support the companies and farmers engaged in the pilot badger control operations which have begun. May I respectfully remind CLA President Harry Cotterell that farmers and the government are slaughtering healthy animals - these cattle and badgers are not sick animals and so I will now explain why this is so. On a Farmer's Guardian article titled '160 farmers meet to discuss how to keep TB out of Cumbria', a farmer told me that they slaughter their cattle before they get sick, but the fact is they are not sick and the idea that they will get sick is only a theory. If an animal is sick with lung disease, then there will be a reason for that and the reason will in most cases be found in the way that animal is cared for, poor diet and bad farming practice. We all believe that TB tests pick up infection but I do not think so. These tests must test for something, probably some kind of soil organism that is natural to the countryside and which is basically harmless - this is a guess because I do not know what these tests are picking up but no one else knows either. We must take a close look at these testing kits because the tests in themselves are not the problem; the main problem is that science/virology translates these test results into infectious disease and this is the main issue. I will explain exactly what is going wrong. If we go back 30 years to the start of the war on aids, we can see that this disease, which was basically a toxicity disease based on drug abuse and living a 'fast track' experimental lifestyle, was not infectious, but in those days we had a US government scientist - Robert Gallo - who conjured up a theory based on infection. This was a classic example of a virologist in search for a virus. The government, the politicians, and the health authorities and media all jumped on the infectious bandwagon just like we are all doing in the UK on this TB issue. And then in the war on aids, a third of a million people US met their fate because of AZT, a chemotherapy drug that was so toxic it was incompatible with life. This third of a million deaths were called 'aids deaths' caused by 'hiv' but that was nonsense because we didn't even have a test that was able to detect 'hiv', and even after all this time (30 years) we still don't have one to this day. No one is 'hiv positive' in the whole wide world. Watch the 'House of Numbers' film, especially the segment on 'hiv' testing and this will explain matters. Here is a link to a letter I wrote concerning the flaws in ‘hiv’ testing. Now it's TB and we are doing the exact same thing and it's the same monumental blunder repeated over and over again and no one can do a thing about it. Instead of the grim consequences of branding someone ‘hiv positive’, as in the war on aids, we are now going through a similar process when we slaughter healthy cattle and healthy badgers. If we stop translating TB tests into infection and then understand what exactly these tests are picking up, then life will be better for farmers and also for the animals in the countryside. We need to understand that this is fundamentally a monumental blunder in science, a virologist will always translate a disease into a germ regardless if that disease is 'infectious' or not. Remember polio circa 1950/60s, blamed on 'polio virus', but which was a poison/poverty related disease DDT. It was never infectious, the virus theory was basically a human error based on theory of germ. Concerning TB, if farmers listen, then we don't have to slaughter anything, but this is probably too radical to understand. So until the cows come home, we keep on slaughtering and taking part in this monumental blunder in science, but if we continue on in this way, our cows will not be coming home, as we all know. The problem isn't the cows or the badgers, it’s the human interpretation of a test that we don't understand. All a virologist can see is a virus, I think that is obvious. This 'infectious theory' which is the basis of TB testing is deeply flawed but it’s the same old story. I have written to David Attenborough, The Princess Royal, Bill Oddie, Brian May, Simon King, Michaela Strachan, Ray Mears, MP Mary Creagh, and all these big named protesters against the badger cull and even they cannot digest what I am saying. 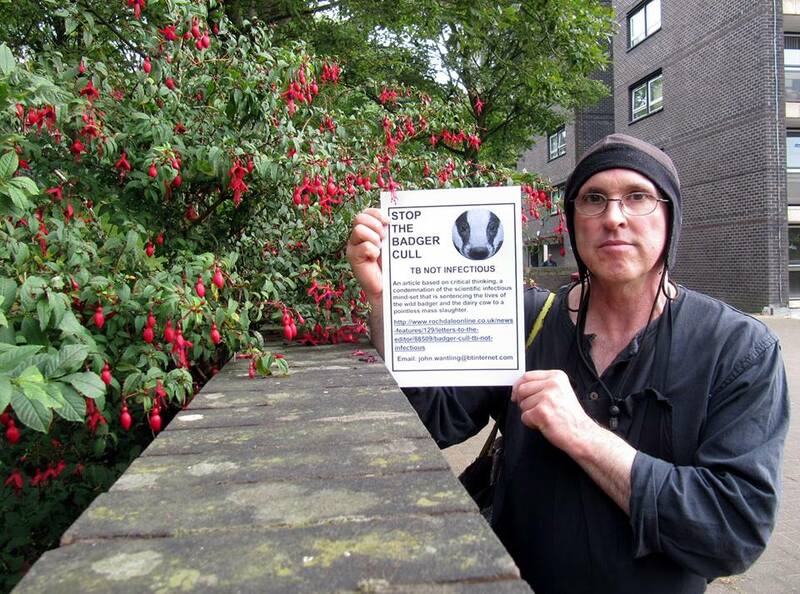 But out of sheer ignorance, they support the theory of infection but at the same time protest against the badger cull. No one has really grasped this issue, but then again the farming community hasn't either and neither has the corridors of power in government and science. It's a very sad situation. I offer a solution to this madness where we don't need to slaughter any animal because infection is only a theory, and I am fairly sure that this is a bad theory. But it is a cultural taboo to think like that because this idea of infection is one of the corner stones of science and medicine. So we end up slaughtering healthy animals on the basis of a bad translation in science. “But exactly how M bovis is transmitted between badgers and cattle remains unknown”. So basically, I am saying that TB is almost certain to be non-infectious, and that we only arrive at infection because we repeatedly make the mistake of translating a TB test result into an infectious disease. Between a so-called TB test result and the theory of infection lies a human being who translates that result into an infectious theory. This human being is the weak link because the only thing infectious is that theory; it isn’t the cattle nor is it the badgers. It is only then that we can make some sense out of this whole issue. CLA President Harry Cotterell is merely jumping on the infectious bandwagon without a thought and this is why we make monumental blunders which in this case is destroying the farming industry and also destroying healthy cattle and healthy badgers who are merely doing what badgers have always done in minding their own business and getting on with life - the slaughter of the innocent! The views expressed are those of the author of the letter and not those of Rochdale Online.